The ETOILE Gold Wedding Hair Comb is a beautifully large, statement wedding hair comb in shades of gold and bronze. 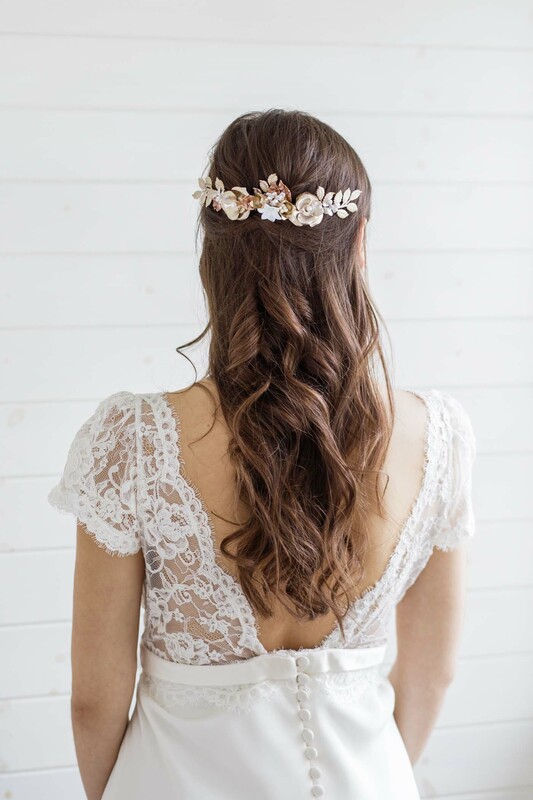 Designed to sit perfectly across the back of the head, either above a half up hair style or a full up-do, the Etoile hair comb also its perfectly over a wedding veil. Two multi-sectioned roses with pearl centres are adorned with hand formed clay leaves, gold botanical leaves and clusters of smaller flowers in gold and ivory clay. All set on a luxurious metal comb, ready to slide into any hair style. 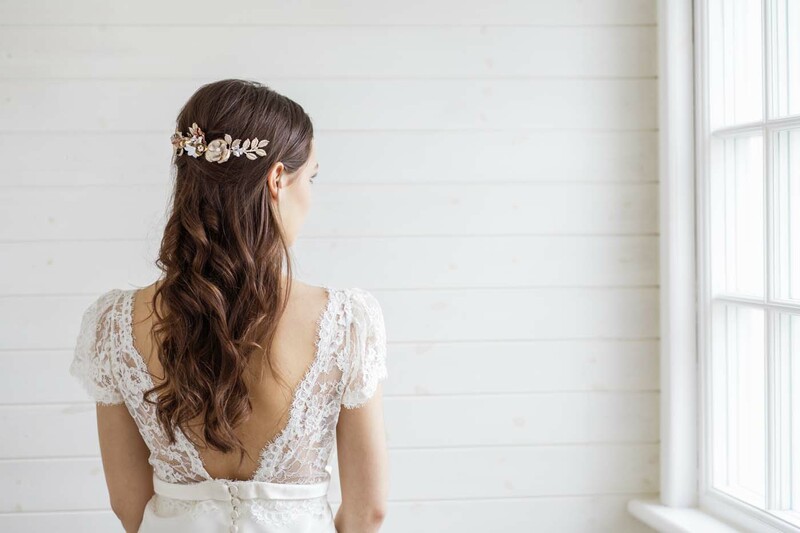 The Etoile Wedding Hair Comb is available in Gold/Bronze as shown, all gold or in silver. Usually ships in 4-5 weeks. Rush orders can sometimes be accommodated – please contact us to confirm your time frame. 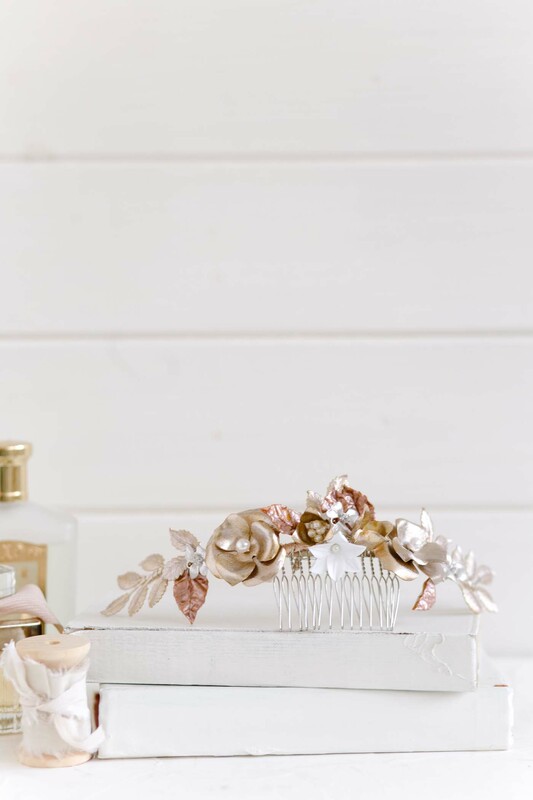 The ASTER Pearl Wedding Hair Comb is a beautifully delicate yet make-a-statement hair piece. Dozens of delicately hand formed leaves are coated in enamel before being intricately twisted with heaps of freshwater and Swarovski pearls clustered in the centre for the perfectly feminine bridal hair comb. This wedding hair comb is asymmetrically designed, perfect for wearing off-centre in an updo, or along the side of the head. If you would prefer this design to be symmetrical (i.e. with equal leaf detail to each side of the pearl clusters) to wear in the centre of an update or above a veil, please just pop us an email or add a note to your order. 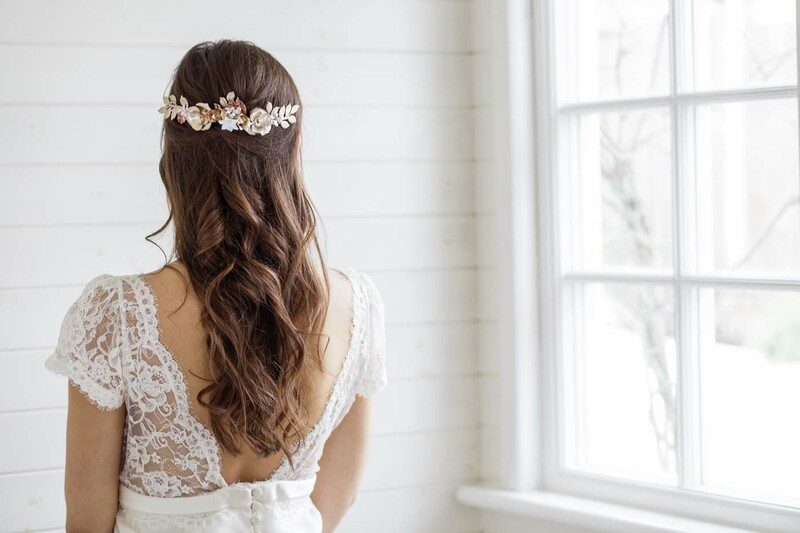 The ASTER Pearl Bridal Hair Comb is available in gold, rose gold or silver, and set on a beautiful wire comb, ready to slide into your chosen wedding hair style. It is also beautiful when paired with one of our hair vines as shown in the first photo, to give a full circlet look. Please note the hair vine must be purchased separately. Gorgeous wide wedding hair comb set with fern leaves, opal rhinestone swags and adorned with hand beaded leaves and freshwater pearls. Each comb is handmade to order in our London studio and can be customised on request. This gold bridal hair comb is also available in silver and with ivory or blush pink freshwater pearls and seed beaded leaves to match. 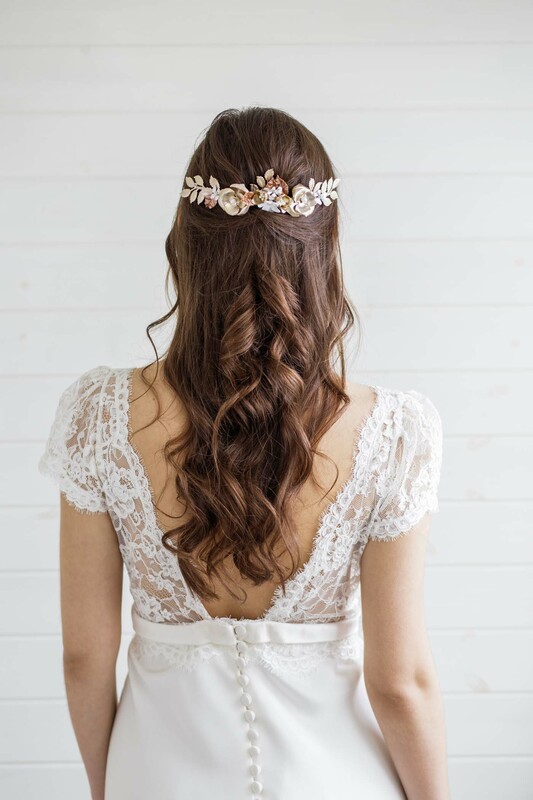 A stunning statement bridal hair comb with Swarovski rhinestone swags, orchids and freshwater pearl sprays set on 2 small combs to fit effortlessly into the hair, working perfectly along the side of the head as well as at the back in an up do. This gold bridal hair comb is also available in silver and the rhinestones can be customised in a wide range of colours. A gorgeous gold bridal hair comb evoking a Grecian style and perfect for a destination bride. 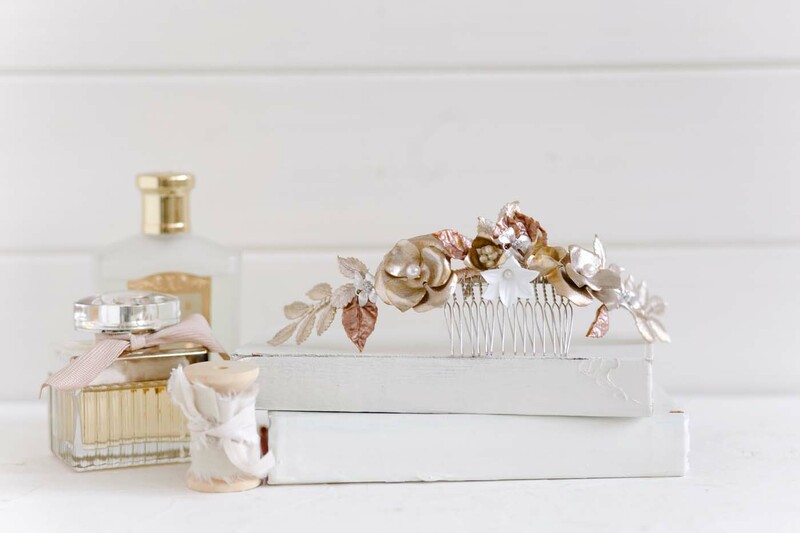 This handmade hair comb is set with a gold or silver plated vine adorned with hand wired freshwater pearls, Swarovski crystals and tiny Japanese seed beads. A lovely intricate piece, this comb would look fabulous as a set of two.